When they took delivery of this year's new harvest hops from the USA, the 3 Ravens brewers decided to do something to mark the occasion. And that was to cram a heap of them into a beer in the not-so-little tank where their Little Ravens limited release beers are brewed. 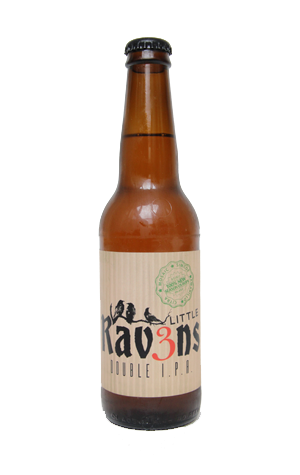 And, despite being "aggressively" dry hopped with a "rather absurd amount" of Mosaic, Citra, Simcoe and Amarillo, it remains, by recent Little Ravens standards, quite normal: no weird ingredients or treatments, just lots of fruity hops. It's their attempt to pay homage to the big American IPAs that continue to wow beer tourists when they head Statewards. In the brewers' words: "When we dream of American IPA, it's as pale as lager, as dry as the Nullabor, as tropical as breakfast juice and with a bitterness so bold yet soft it could be mistaken for John Coffey in The Green Mile." And they've done a fine job of hitting their target. Before we'd seen the above words, we'd had a sample at the brewery and remarked that despite being awash with juicy hop aromatics, the beer was lean as anything. What's more, considering they're claiming 85 IBUs of bitterness (pretty damn high, in other words) it's no palate shredder, delivering flavour without doing any damage. As with Feral when they release their Tusk IIPA, the Ravens crew is encouraging venues to tap the beer as soon as possible to retain freshness so if it sounds like your thing, get in quick!